We are still unearthing great Black Friday camera deals (as well as Cyber Monday camera deals) – and we have found a great offer from Wex PhotoVideo and from Park Cameras, that allows you to save a full 10% off the latest Hero7 actioncams from GoPro. 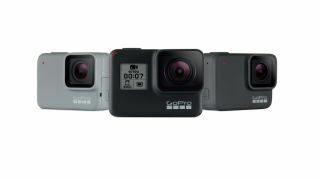 The GoPro Hero7 Black, Hero7 Silver, and Hero7 White were only launched in September, so we are really excited to see these cameras discounted by up to £37.90 in the run-up to Christmas – as we know that these little pocket cameras are perfect presents for any skateboarder, cyclist, skier, adventurer, or traveller in your family. Here are some of the best GoPro deals. We weren't expecting to see this good a deal on a camera only released a few months ago, but you can bag the 10MP GoPro Hero7 Silver for under £200 right now. That’s a cool £60 Black Friday discount off the original launch price back in September.